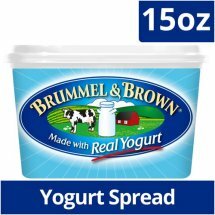 Deliciously creamy Brummel & Brown Spread Made with Yogurt is blended with the goodness of natural yogurt. Be sure to try Brummel & Brown Simply Strawberry Creamy Fruit Spread, too. It is the only spread with real fruit and the goodness of natural yogurt.